The eroded hills behind Anchorage and on Motuareronui Adele Island are not what nature intended. What we should be seeing is a low forest of kanuka, along with hard and black beech. Instead, fire events over the last 200 years (sometimes planned, sometimes not) have left exposed ridgetops ripe for colonisation by introduced weeds like hakea. Restoration supervisor Helen Lindsay updates us on the beech planting project aiming to bring beech back to the hillsides. Project Janszoon is carrying out a beech planting programme on the eroded hills behind Anchorage Bay and on Motuareronui Adele Island assisted by the Abel Tasman Birdsong Trust and students from Motueka High School. Black beech and hard beech are keystone species in these areas and there is evidence that they were formerly present in both these locations. Low fertility, combined with the exposed, summer-dry nature of the ridgetops and north-facing shoulder slopes mean that the natural vegetation pattern was likely to have been one of a low-statured open forest community of kanuka, hard beech and black beech. But burning events within the last 200 years have curtailed natural regeneration to the point that there are open eroding zones with little or no vascular plant cover. Expansion from ‘islands’ of heath-like vegetation dominated by kanuka, mingimingi and Gahnia setifolia,is slow and seemingly dependent on the accumulation of organic matter in moss and lichens from the margins. It is expected that planting beech around these margins will assist the colonisation of beech into these bare areas. In 2014 trial plantings of black beech (Fuscospora solandri) were established in random plots on the dry ridges of Adele Island. The purpose of the trial was to see whether planted trees could survive the harsh dry conditions and competition from Hakea salicifolia, the vigourous weed that rapidly colonises open spaces on the island and at Anchorage. 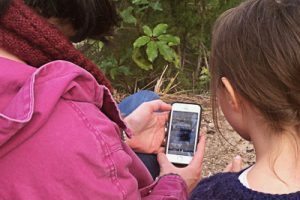 In May each year volunteers from the Abel Tasman Birdsong Trust and Motueka High School assist DOC and Project Janszoon staff to monitor these trees. 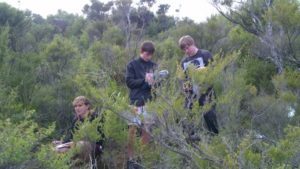 As the plots were selected randomly the trees were not necessarily planted in optimal conditions but, after three years of monitoring, results indicated over 90% survival and trees planted among Hakeaare competing well. Most of the tree deaths in the trial are due to positioning in spots that are too dry and exposed and this and other learnings from the trial will be applied to the major planting programme. Another trip to Adele Island was undertaken in May 2018 to continue monitoring the original trial, preliminary results showing 87% survival rate since 2014 with some of the trees growing by nearly a metre in the four years. These results have given us enough confidence to believe that with more careful positioning it would be possible to establish enough trees at planned sites on both Adele Island and Anchorage. In July a planting programme was commenced, initially to introduce 100 black beech trees at each location. The logistics of getting so many trees to these high points was challenging but with the assistance of Reid Helicopters and a large cage, the plants were slung out to the island. DOC recreation staff used a graveller to transport the trees up to the ridge behind Anchorage Bay. 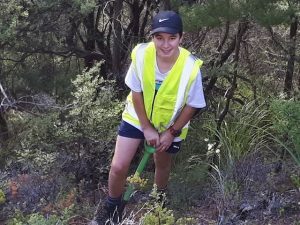 Motueka High School students planted the trees at Anchorage as part of their Adopt a Section programme and Abel Tasman Birdsong Trust volunteers planted the sites on Adele Island. It is planned to plant 200 trees at each site annually over the next ten years and we will be monitoring the sites regularly.